As with most things in life, the secret lies in good preparation! As we where building our bale walls, we made sure there where as plumb as possible. Now it’s time for the final adjustment. This involves going around with a sprit level and the persuader (big hammer! ), and hitting the bales into place from either side. It most important to get the outside looking stright at this is needed for good weather protection. Also on the inside the walls are going to be broken up with furniture etc, where as the outside you just have a line of the wall to focus on. It takes longer than you might think, but means we will have lovely straight walls once the plaster is on. Therefore it’s going look more like a ‘normal’ house and less like a ‘hobbit’ house. 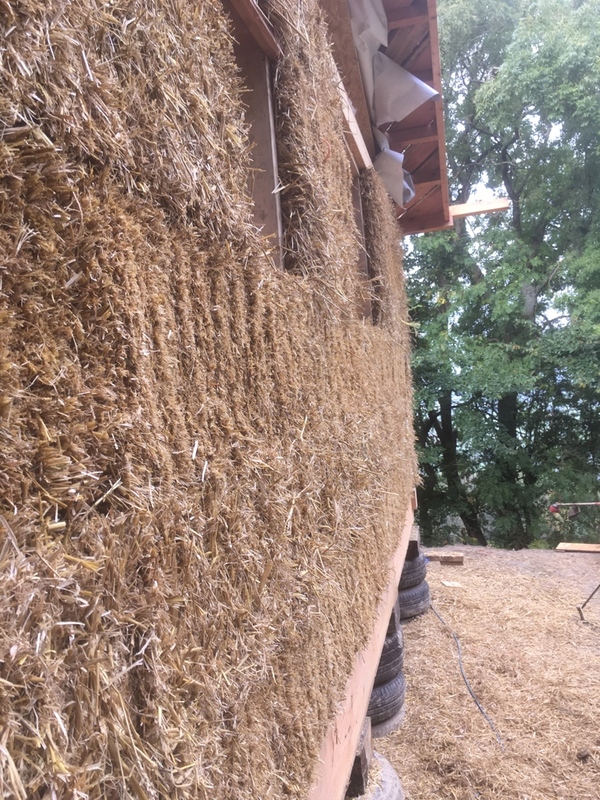 I use the term ‘hobbit’ loosely, as it seems to be a popular Daily Mail term when it comes to straw bale…. Though I know many people are keen to point out that the hobbit house in the films where actually Victorian in design. But if hobbit houses are actually Victorian, does this mean that the Daily mail prints things that aren’t true…. I will leave to your discretion, and get back to the topic in hand. To make our bales less ‘hairy’, we gave them a hair cut. Because the surfaces are now flatter, it means it has less surface area and will take less plaster to make it into a nice smooth finish. It also gives the plaster a better key, as well as making sure the wall is flat and smooth. This was done using a garden strimmer and a hedge trimmer. At the corners, where we wanted to create nice curved reveals, we used the alligator saw to do this. The curve makes the plaster stronger, as in gypsum plaster you need metal corner stops and all sorts to give it strength. 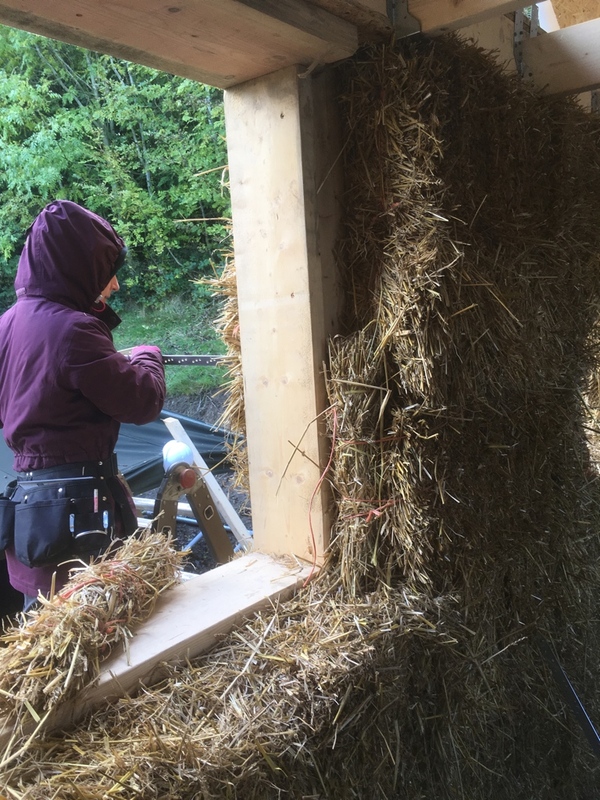 Where we had openings, it was important to tie the bales together, to iron out any gaps and give ourselves a good key for plaster. I will try to explain but please see diagram & pictures below. Start at the top bale, loop around the bale below (second bale), and then back up to the top bale, loop around, then down to the third bale, loop around, then up to the second, loop around, and continue down until all bales are tied together, tie off at the end. Repeat either side of window/door post. Diagram in elevation, applogies for my drawing! Where we have our box beams we need to give them a good key for the plaster, we do this by attaching (with nails) 20mm woodfiber board either side of the box beam (inside and outside). The wood fiber board also acts as an insulation, and helps reduce any thermal bridging through the box beams. Notice the wooden plaster stops at the bottom of the wood-fiber board or on top of the window frame, with drip edge to help shead water. Where we have any deep gaps/holes in between bales this need to be ‘stuffed’. This is for many reasons: to improve insulation values, to improve airtightness, to avoid weak patches at plastering stage, to give a uniform wall to plaster onto. Remember though, SNUG NOT TIGHT, or the wall may start to snake! To stuff grab a handful of straw, and pull apart to make it 1.5 times the length it was (this way straw are intertwined and stronger), twist the straw and fold in half, twist again (like we did last summer….). Insert the skinny end in first; you can use a stuffier (stick, preferable with a notch in the end to grip the straw). The twisted straw will expand slightly and act like a wall plug holding the straw in place. 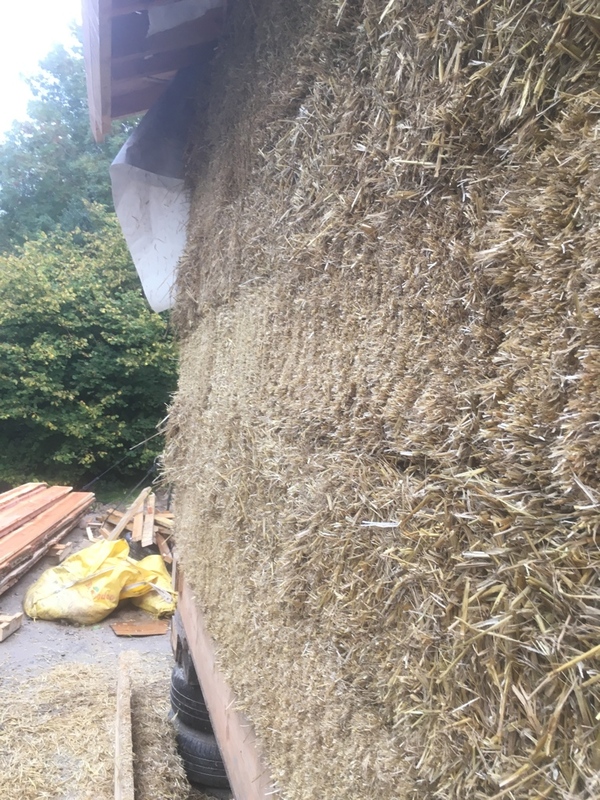 At opening where the bales didn’t quite meet the window post in a nice rounded fashion, we needed to infill with sausages (bundles of straw tied together). These where then stitched to the bales, using bailing needles going through the whole bale. Or held into place using ash staples. Please see pictures below. 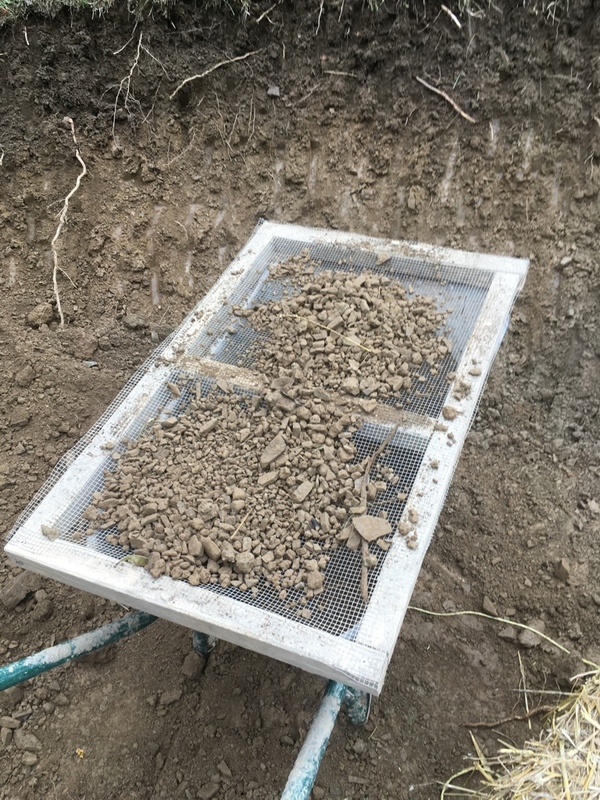 And now to prep our clay for the plastering mix! 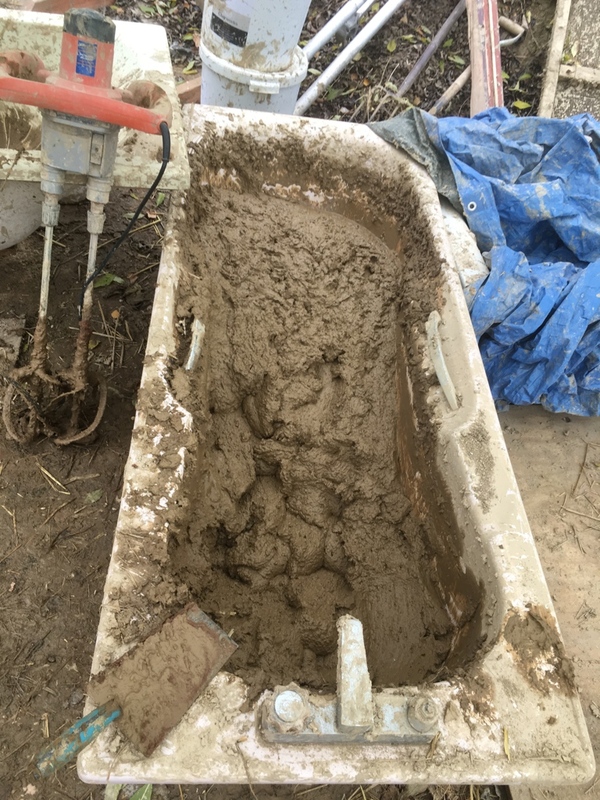 Dig dry clay from site, sift through 5mm mesh, use stones as hard standing, put clay into bathtub and soak over night, whish thoroughly until thick custard consistency, we can always add more water, but we can’t take it away! Please see pictures below.